I don't know much about stage moms. I hear that the show Toddlers & Tiaras would be a good learning tool on this front, but I'm far too scared to watch. 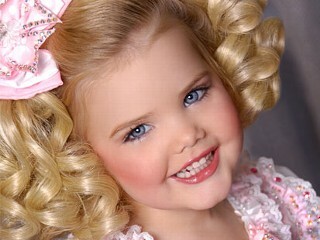 A 3-year-old wearing foundation, blush and false eye lashes is simply not natural. I'm getting the heebie jeebies just thinking about it. I can, however, understand the desire for your children to like the same things that you like. For example, I love the beach, just love it. The ocean, the sand, the unobstructed sunshine - it's all perfect. If I someday have a child who despises the feel of sand between her toes, I would probably be devastated. I would be heartbroken if my 4-year-old son told me that An American Tale was a stupid movie. Or, what if I have a daughter who hates shoes?! GASP. Of course there's no point worrying about it, mostly because I don't have kids and less so because it would be out of my control even if I did. That's what I thought until I recently listened to a news story on NPR.org entitled Baby's Palate and Food Memories Shaped Before Birth. This article doesn't explain how to force your child to love An American Tale, but it does have some advice on how to guide your baby's food preferences. Here's a quick summary: Everything that a pregnant woman eats affects the smell and flavor of the amniotic fluid only a couple hours after consumption. The more often a pregnant woman eats certain foods the more exposed the unborn baby is to such foods. When a baby begins to eat food (other than breast milk or formula), he or she is more likely to enjoy foods that are familiar based on experiences in the womb. If mom eats broccoli every day twice a day during pregnancy, baby is more likely to enjoy eating broccoli when it comes time for solid foods. I will be eating a ton of drunken noodle and ice cream during pregnancy. I could probably forgive my child's rejection of The Cutting Edge (an amazing work of cinematic genius), but I don't think I could survive without sharing family meals of Thai food and ice cream sundaes.